Attended Marathi Sahitya Sammelan yesterday (27-12-2010) to meet and talk with people who create lots of content in Marathi Language in Thane. Following are the observations. 1) There is lots of content/books available in Marathi language, This covers almost all the topics. As compare to Last years Pune Sahitya Sammelan, In thane very few software/web development stall was available. most of the books are still not digitized. I think OCR will be very helpful in this case. 3) Mostly people used InDesign on Windows for books, and they are still using 8-bit (non Unicode) fonts for it. In Fedora 14, Now there is no need to select even keyboard layout as well for your language, just select your language while log-in in GDM, ibus will auto detect your layout for your language, and by default it will enable all. No one aware about this, i updated them about this and hopefully in there next release they will update notes about fedora as well. 6) I had a chat with Marathi Abhyas Kendra on recent development in Fedora i.e Updated in Lohit, Keyboards, Enhanced Inscript. One good point was they are Planning to host competition for Marathi font deigning i really appreciated that and agreed to give full support for same. Even today we do not have much active community around font development hopefully with such event people will be aware of font development process and start contributing. Attended some talks on Marathi Libraries problems and possible improvements. One speaker (sorry forgotten name :() said agree that each person cant by iPAD/digital book reader but might be we can keep 5-10 ipad in each library and let people use them in library. this will be also a good start. He mentioned about Amazon.com that they not only sell soft copies but also courier the hard copies of book on demand as well. The best thing i heard was he said don't give anything free to users, if we give it free user's does not value it well, always charge at least some/very little fee for same. Attended one traditional dance event as well. We are doing so much development for end-users/community, but sad to say very few are aware about it. Users are living in there own world. We should really start to do some event for people, who are developing contents in regional language, let them aware about to latest development happening in language technology. Try to bring them back from Windows proprietary world to open source collaborative world of Linux Fedora. I will be very happy to see and contribute to such events. I talked with some people on how we can reach these users and answer was to media/new papers/press conference are the best way to let them know what are the available stuffs. I was just checking is there any other open source indic fonts, supporting locl opentype feature, but i did not found any other. In Lohit now we have locl feature, so we have added locale specific shapes for Nepali Language. One can test this by Typing "क्र" in gedit or in firefox, open this file with firefox ro gedit in ne_NP locale and see same with any other locale as well. One can easily observe shape difference. There are some difference in uses of Devanagari in each language, will be good if we get some document about this difference we will happy to implement it in lohit. This problem can always happen, i.e. we sent document in one format and person cant able to use/open it. So i suggest all please use open format whose specification are open and any operating system developer can easily add support for it. We can always use .pdf format it is open and any person receive it, no need to by Windows Operating System or MS Office just to open it. If we use .pdf it can be open on Linux, Mac and in Windows as well and even most of the smart phone now has ability to open pdf. Alternatively use openoffice (OpenSource office suite) it is available for Windwos, Linux and Mac as well. It uses open format like .odt. Its storage specification are open and any application can easily add support to open it without paying anyone any royalty. Unlike .doc is proprietary format its specification are not open so no office suite can offer to open it, and with hack to .doc they cant give proper support for .doc. Communication standards must be always open without dependencies on particular company's format, Think for a language we speak, if we need to pay royalty to some company for each word of language we speak then what will happen? .doc is Microsoft proprietary format. "www is open standards that why we can open any html page with any internet browser or any application on any OS. Anyone can implement it as it is open standard"
"At least we can start with using pdf for communication"
looks like history is repeating itself!! looks like history is repeating again the same way Microsoft took most market share, since they were just providing Software and most of the hardware use that and increased their market share and Apple was pushing there excellent software with Hardware. At the End Microsoft won. Now same way Goggle is providing only Android OS and all the Manufacturer using this OS (Sony, Samsung, HTC, Dell) so their market share is increasing very fast, On the Other Hand iPhone and Nokia pushing client for OS with Hardware. I think it is hard time to think them for their strategy for more market penetration or competing with Android. USB Pen Drives are cheaper now days 1/2 GB cost something around 200/300 rupees, and every computer users now at least have one with them. So this feature has a good number of potential users. In past i have met many windows users, they like Fedora lot and even want to try it. But the main problem they are facing is how they can do it on there existing windows system. And options were dual bit (risk of data loss and need to install on existing harddisk), Virtualization ( but it does not give food speed) so both has some problem. Even if i wanna do this for them is very time consuming and that why even though i am interested not got a much time to do this for them. But now its excellent time i can just burn live ISO to there pen-drive and then they can use and even demonstrate excellent Fedora to other. The best thing even after burning ISO to pendrive we can still use it as a storage for other required file, it will not affect its booting stuff. Here i would like to suggest fedora users, always keep Fedora-Live iso on your machine, and whenever any windows user get interested in Fedora do give him his own Fedora OS with him he can play. One improvement is possible here to make one fedora live iso with openoffice (libreoffice) as well, yes agree it has limitation since one cant burn it on CD due to size limitation, but it has scope for use on PenDrive since size now days 1GB and more so one can easily use that. I am making this point since if we wanna stick new user some more time in Fedora live OS then he need officesuite as well for playing. initially thought it will be easier one, just will increase kern for U+0d4d characters, and whenever it will followed by U+200C in will just make it kern to minus. Just done 1.06.0 release of Liberation Fonts. Now releasing source tar ball as well, so if someone want to build from source can use this tar ball. If someone want to direct use ttf file, he can download Binary(ttf) tarball, and use it directly. 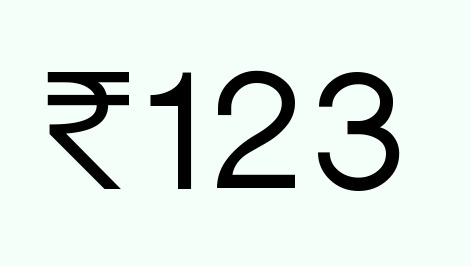 Friday saw the news on new symbol for INR, i felt really happy since the prevoious one U+20A8 ₨ was based on latin shortname for Rupees, and never it was looking like symbol. Just capital R and small S combination. That's why it was really less in use, and many people were not aware of this. While checking in locale i found this one only used in en_IN locale. 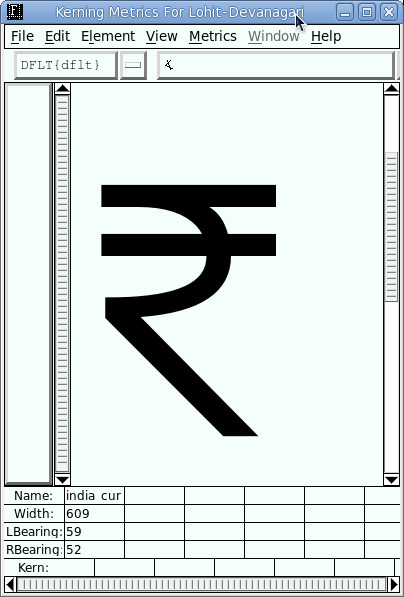 Other locale were using locale initial for rupees. i.e in Marathi and Hindi रु. was used for currency symbol. Same for Other language in there own script. 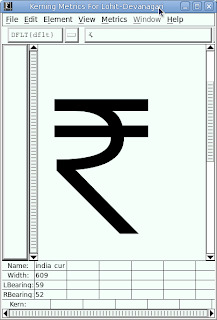 Standardization is really favourite topic of mine and really with this one we can standardize INR symbol. I am strongly recommend to add this symbol also on same Unicode code page. Since no Unicode values is assigned to this, there is no standard for typing or storing this character. I have added this character on U+E000, which is unicode private user area. I saw some people http://blog.foradian.com/ added new INR symbol on ` location, but this is one kind of unicode spoofing. Since in actual storage you are going to store ` (U+0060) and whenever you want to type ` character you will only get new INR symbol.